If you're anything like me, when it comes to a makeover, you're more conservative than radical and prefer slight changes that aren't so dramatic. So, in case you're in the spirit of a new look, I found bangs to be the perfect option. You won't be sacrificing the length of your hair or change its color, but it'll still make you look fresher and different. Bangs never go out of style, but it seems that many people regret the decision as soon they are cut, and that's because there are a lot of factors to take into account such as face shape, bone structure, and everything in between. 1. Type of bangs. First off, decide what kind of bangs you want. 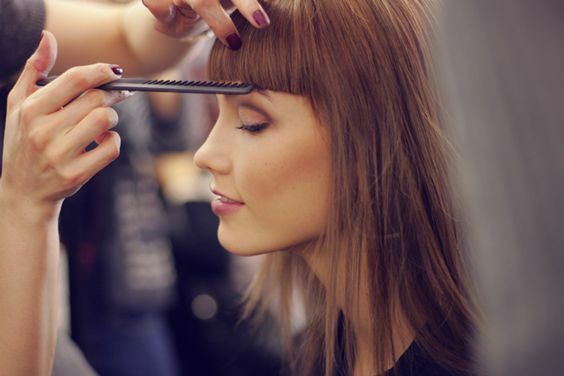 From straight, blunt bangs to side-swept, there are different ways and styles to trim bangs that may look better or worse, so decide which style fits best with what you're looking for. 2. Face shape. Every face shape demands different things. For instance, heavy, blunt bangs look better on oval, long and square faces, while side-swept bangs flatter rounder faces. Look for inspiration from celebrities with your same face shape. 3. Hair texture. This is as important as face shape. Bangs go best on straight or light, wavy hair. However, curly, thick and coarse hair may need other techniques to frame the face. 4. Maintenance. Before trimming, know that bangs come with a high level of maintenance. Styling bangs is not the same as styling the rest of the hair since they are more prone to be affected by humidity and wind. You'll need extra time hairstyling and maintaining the length and shape of your bangs regularly. If you're not that committed, go for side-swept bangs that require less maintenance. 5. Type of skin. Besides face and hair, your skin also affects the decision. Ladies with oily, acne-prone skin should really consider bangs since they rest on your forehead and might trigger breakouts from the oil of the hair. In that case, be sure to keep your hair super clean and give extra effort on cleansing your forehead every day and night. 6. Have a stylist. Last, but very not least, don't EVER self-trim, especially if it's your first time with bangs. Unless you're a pro, cutting bangs should never be a DIY project. It takes a lot more than just grabbing the scissors and trimming. Leave it to a pro who knows what's best for you.